The Berry Schools write to Judge Ricks that when Martha returns she will be given the letter sent by Mr. Ricks. They also note they are glad to hear Oliver is doing well in Richmond. 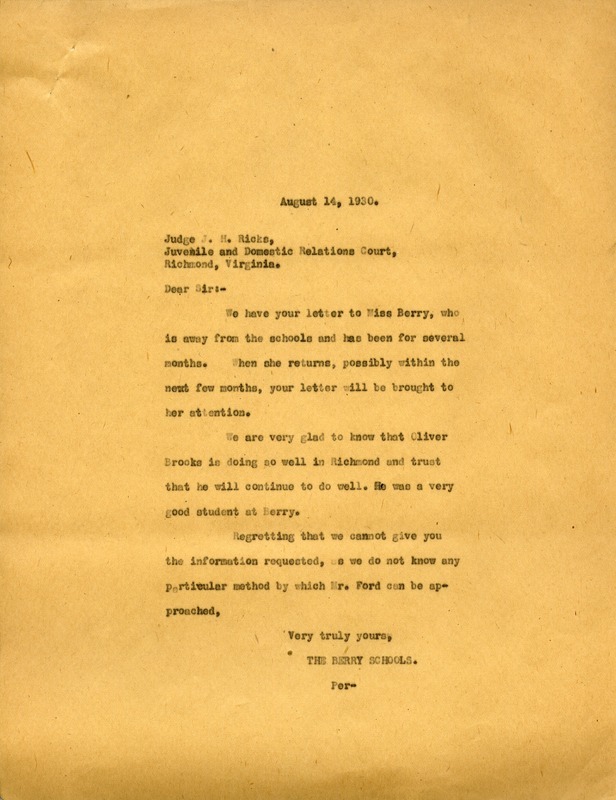 The Berry Schools, “Letter to Judge Ricks from The Berry Schools.” Martha Berry Digital Archive. Eds. Schlitz, Stephanie A., Aaron Jackson, Meg Ratliff, et al. Mount Berry: Berry College, 2014. accessed April 20, 2019, https://mbda.berry.edu/items/show/13834.